It’s a Spring Fling Pickleball Thing. 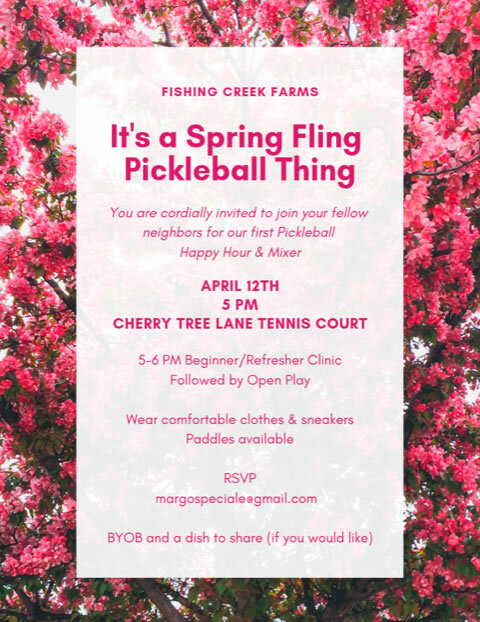 You are cordially invited to join your fellow neighbors on April 12th for or our first Pickleball happy hour and mixer. 5-6pm for beginner/refresher clinic followed by open play. Wear comfortable clothes and sneakers. Paddles will be available. Please RSVP to margospeciale@gmail.com. BYOB and a dish to share (if you would like).